WXR 2019 Cyber Monday/Tuesday Sale! Today only! Get $100 off your ticket to WXR 19 with the code CyberMonday. (Yes, it’s Tuesday.) This code is good until 11:59pm Central on Tues, Nov 27, because that’s how we roll. Looking for a holiday gift for your writer? Or yourself? How about a writing workshop and retreat wrapped inside a Caribbean vacation? 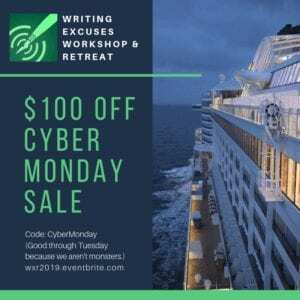 The 2019 Writing Excuses Conference and Retreat is now open! WXR19 will be from Fri, Sep 13 to Sun, Sep 22. We’ll leave out of Galveston, TX on Royal Caribbean’s Liberty of the Seas, and we’ll travel to Cozumel, Georgetown, and Falmouth before returning home. Come join us! When we talk about space travel we’re usually talking about rocket scientists and astronauts. In this episode we spoke with our guests Bart Smith and Ben Hewett, about the “unsexy” (read: possibly boring but don’t be deceived) side of the space program—budgeting, logistics, and procurement. RFI and RFP, with toilets, hammers, and business cards; that’s this episode. Relax! The “rules” of NaNoWriMo are not YOUR rules. If there’s a way you like to write, write that way!